Looking For An Electric Knife? You’ll Want To Read This First! Home General Looking For An Electric Knife? You’ll Want To Read This First! 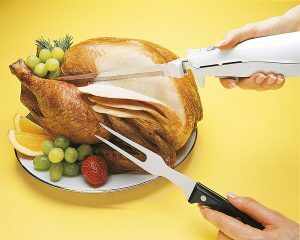 So You’re Thinking Of Getting An Electric Knife? Welcome back to myelectricknifesharpener and I hope you’re having a splendid Saturday! In today’s post we look at a very popular and useful kitchen tool: the electric knife. The inception of the electric knife has simplified our work in the kitchen, but that’s not what we’re here to discuss about today. The discussion today is to pick the best out of the lot: What is the best electric knife is the question I hope to answer today. Since I don’t like to provide baseless recommendations, I’ll be discussing 3 key things you should consider before buying one of these devices, and in the end I will provide my recommendations/top picks. Alright, let’s get cracking! Consideration #1: Don’t Think Of It As A Replacement! The idea that electric knives can replace traditional blades entirely, is a false notion. While that may be obvious to some, it isn’t to others. I’ve had people ask me if they can use an electric knife, as a complete replacement to their non-electric steel counterparts. N-O! Not a chance in hell! Why? Well, it’s as simple as this: Not all knives are the same, therefore they cannot and should not be used for the same tasks. Kitchen knives alone are incredibly varied. Thinking of all the different kitchen knives is enough to make your head spin. Chef, paring, utility, boning, bread, sushi, and carving are just some of the few blade types. 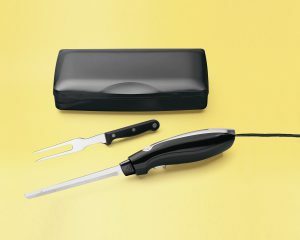 Without making this longer than it needs to be, here’s what you need to understand: an electric knife is particularly great for cutting meats and breads, but by no means is it a universal “do it all” solution. It’s important to understand this before going forward. I hope you do! Another very important thing to consider for all knives, not just electric, is how it feels in your hand. Is it bulky, and hard to grip, or light, nice to handle and ergonomic? When buying a traditional knife, it’s very important to me to choose something that feels good in my hand. There’s a certain element of compatibility to this. In your quest to find the best electric knife, this is something you will definitely need to consider. Unfortunately, it’s just not that simple, especially if you’re looking to buy online. If you buy in store, you may have the option of holding the knife in your hand and seeing how it feels, but buying online doesn’t afford you this freedom. As with everything there’s a trade off: buying online gives you more choices and the possibility of buying cheaper (not always true, though), but buying in-store allows you to handle the device. This is where a little research can go a long way. Do your homework and once you’ve narrowed down your electric knives to 2 or 3, go in store and get a feel for them. Now you can decide which one to get, and investigate online for cheaper options! How Does It Feel In Your Hand? Is It Comfortable Or Too Bulky And Awkward? Each of these could be a separate topic by themselves, but I’ve chosen to bundle them together as one consideration, since there isn’t too much to say. Alright, let’s break it down one by one, shall we? 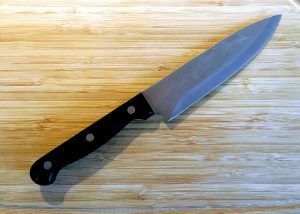 Unlike traditional steel knives, electric knives tend to be quite a bit larger and clunkier, and this is why storage becomes important. Ideally, the device should come with a storage kit/box, so the knife can be safely stored when not in use. The last thing you want to end up with is a damaged cord or blade because of being unable to properly store the device! How simple is the device to operate? Does it come with a safety button? And lastly, how easy is it to insert, remove, and change blades? The best electric knife will satisfy all these conditions. I’ve said it before and I’ll say it again, warranty is important for ALL electronic devices. The coverage duration is definitely important, but you should also understand the warranty conditions. What happens if your device fails? Will it be replaced or repaired? Will you have to incur a cost to ship it back to the manufacturers? It’s important you have answers to all these questions before splashing the cash! We talked about blade removal, insertion, and replacement, but cleaning is another aspect. As far as blade cleaning is concerned, I only have one opinion: No blade no matter how cheap deserves to be put through the torture of a 40 minute dishwasher cycle…..period. And this includes electric knives. Unfortunately, not everyone is of the same mindset, and for these people dishwasher safe parts become important. If you’re one of these people (and I hope your’re not), then you may want to check if the electric knife blades are dishwasher friendly and able to adequately fit in your dishwasher. 2 Of The Best Electric Knives That Outclass The Rest! One of the things that makes this the best electric knife is the fact that it comes with both a bread blade and a carving blade (nearly all other electric knives come with a single blade only). Cutting bread is not the same as carving turkey! A Solid “A” For Presentation & Storage! You can tell that someone really thought this through before designing it. Unlike many of the other electric knives, it’s not something you simply toss back in the original box once you’re done. It looks pretty sleek on just about any counter top, and doesn’t even take up a lot of space! This is probably one of my favorite things about this device. It works as intended and doesn’t actually crap out! Whether you’re cutting meats or harder breads, the motor and blade work well to get the job done. It feels comfortable to hold during operation, and doesn’t feel like it’s about to slip out of your hands. It’s also not as bulky as some of the other electric knives. Obviously, there are some negatives associated with this product (and don’t believe anyone who says otherwise! ), such as having to pay shipping for any warranty concerns, and a few isolated issues with overheating, but compared to the rest this is my pick for the best electric knife. 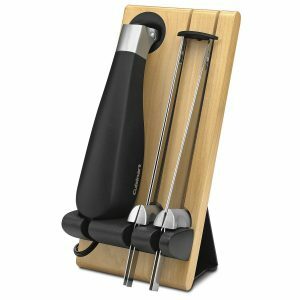 This is especially useful when carving that thanksgiving turkey. I don’t have a carving fork lying around in my kitchen anyways, so this extra bonus makes me happy! I like the CEK-40 (above) wood block presentation more, but this does the trick as well. Since most people will only get around to using this device over the holidays, it’s best to have it safely stored in a compact case. What I don’t particularly like about the 74275 is how it feels to hold. The handle is pretty big, and somewhat uncomfortable. I’d give the title of “best electric knife” to the CEK-40, but this still is an awesome device that is cheap and effective. It finishes a close second. Before I end this post I want to reiterate what I said earlier: you can not expect electric knives to replace traditional steel knives entirely. Having said that, it’s important for you to have realistic expectations! Another thing: even the best electric knife has flaws/drawbacks, and I don’t think manufacturers have yet found a design that really stands out. It seems like we have quite a way before we see these devices improved and perfected, but till then you should do your homework as a consumer and continue to research a product before buying. That’s all from me! What’s your best electric knife? Do you have a different opinion than me? I’d love to hear from you, so please leave me a comment below. Till the next one!